These snowman holiday bubble is a perfect treat to fill you Christmas stocking or to use for Christmas party favors. Each container has a roll of bubble gum similar to bubble tape. 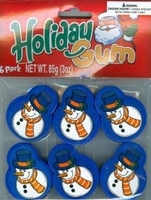 Each pack of snowman Christmas gum has 6 plastic containers. We also have santa bubble gum, Christmas tree bubble gum and santa's coal gum for all those bubble gum lovers.